I finally have a full range of motion with both of my arms, so I thought it would be a good time to post. It seems that Chris has been brought low by a random stomach virus, so he's currently napping. He awoke around 3am feeling nauseated. I think he would have vomited, save for one thing--the lap band. It's purpose is to constrict his stomach so he can't over-eat. The thing that didn't occur to either of us when he was having it placed was that it would constrict things from coming up, too. He ended up dry-heaving for half an hour, then going back to sleep. He managed to go into work, only to call me two hours later to pick him up. Poor guy was very pale when I arrived. I'm hoping it's only a virus that will run its course in a few days. I've gotten into a few things since last I posted that I thought might be of interest. I began stepping down my tacro dose on Wednesday, which meant no pill on Thursday. Friday, a small patch of skin in the crease of my right elbow began to itch. This is nothing new, since it's a regular spot for GvHD flares. This go round, however, the new immune system decided to flex its muscles and try a little something new. There was a patch of skin roughly 2 inches in diameter packed with angry red blisters. I literally looked like I'd been moisturizing with poison ivy. I rubbed in a dollop of cortisone cream and kept an eye on it thinking that I'd be back on a regular dosage of tacro before the day was over. Much to my surprise, the rash disappeared after a few hours, leaving behind a faint red shadow. Saturday, Chris and I took advantage of the beautiful weather to finish up a few projects in the front yard. Since I'm now allowed to do a little light gardening, Chris asked me if I'd like to help him finish mulching the front garden. I will be absolutely honest, I don't love to garden. That's my mom's thing. I don't like playing in the dirt and the smell of fertilizer reminds me of the time I threw up at the farmer's market as a kid. I do love a pretty garden and I appreciate all of the effort that goes into planting and maintaining one. If I can trade on chores to get out of gardening, I most certainly will. When I asked Dr. K. if I could do some light gardening, I was really thinking of potting a few house plants. There's an empty spot on my mantle that I'd like to fill with a pretty orchid. That kind of gardening. We ended up at our local home improvement center wandering the outdoor gardening department. By the time we got home, we had a truck full of mulch, soil, and plants. The plan was that Chris would finish mulching the front garden while I worked on a small strip of grass running along the side of the house and driveway. All of the utilities and clean-outs are on this side of the house and it drives Chris crazy when the weeds invade. All I had to do was layout weed blocking cloth and install a few plants. Seven hours and 55 feet later, with the help of a very determined and loving Chris, the weeds gave way to a narrow little garden filled with coleus, impatiens and hostas. I have had my fill of playing in the dirt and having a variety of insects creep up on me and can even attest to the amazing efficacy of La Roche-Posay sunblock. It's the brand the dermatology fellow at MDA recommended I use and after seven hours outside, I didn't have any color. Granted, I was wearing a baseball cap and long sleeves, but my face is still as pale as it has been for the last three years. No sunburn and no tan. Sunday, I had my first glass of wine. We have been toting this bottle of 2003 Tommasi Ripasso around for the last 2 years, hoping to celebrate. There were 2 bottles before it of the same vintage that a houseguest of our former host helped themselves to while we were in Houston which led to many jokes involving hiding this bottle. Our local supplier doesn't carry the brand anymore, so I'm glad this one survived. I enjoyed that first glass with a medium rare steak, another first in 3 years. It was absolute bliss to be able to have underdone steak. It sounds trivial, but give something up that you love and see how long you go without it. During the transplant process and depending on the protocol your center follows, you will give up fresh fruits, vegetables, underdone or raw foods, herbal teas, alcohol, caffeine, dairy, and a host of other little things. You get to have them back in increments and over time. I still can't have sushi and avoid herbal teas and supplements. I still don't eat salads at restaurants and shy away from meals not prepared by myself or a very small handful of people. Sadly, you can't be sure of hygiene and what I deem clean, you might find excessive. "Dirt won't hurt," etc. Yes, I do occasionally have meals at restaurants. Yes, I know they aren't the cleanest places in the world. I waited tables during college and have seen the shenanigans that can take place. That's for another day. I'm feeling a few of the after effects of spending so much time outside Saturday. There are a few small rashes on my face and chest. My eyelids itch constantly and my scalp is flaking off. It's all worth it to be able to do the things I did this weekend, though. I just got the call from my PA. The preliminary results from my bone marrow aspiration are in and there is NO EVIDENCE of LEUKEMIA. So sorry for all of the typos and grammatical errors in the last post. I'm still functioning under my B-game and feeling lazy. Sorry to keep you all in suspense. Wednesday was an extraordinarily long day in which there were a few surprise procedures and Thursday was a day of recuperation. My first appointment in Houston was an 11am blood draw. My written instructions were to begin fasting at 7am the day of the appointment. I dutifully finished my sugar free red-bull at 6:45 and fantasized about all things pastry until 11. Unfortunately, the phlebotomist asked me if I'd been fasting and I gave her the details of my breakfast as mentioned previously. She made a face and informed me that my vial labels said I was to have fasted for between 12 and 16 hours. I told her what my instructions had been. She elected to speak to the head phlebotomist. Phone calls were made and I was lectured by a woman sucking on a large piece of candy. It's hard to take anyone seriously when they're making slurping sounds. The lab said it was up to me. I clung to the fact that I had heeded my instructions and told them to get the blood. I was told yet again that the reading wouldn't be accurate and that it would be a waste. Since I knew what was being tested, I stuck to my guns. 16 vials of blood later, and I was released with a shake of the head. Noon found me getting a bone density scan to evaluate any further bone loss. The good news is that I've made very small gains overall. 1pm was slated for a bone marrow aspiration. We were ahead of schedule, so Chris played video games while I knitted. While we were waiting, I was seated next to a young woman and her friend. I'd have to guess they were in their very early twenties. The woman sitting close to me was wearing the kind of face mask available at hardware stores and usually worn to keep dust and debris out. I have to assume that she was wearing it to make her friend, who was obviously undergoing treatment, feel less conspicuous. You really have to love your friends and the lengths they will go to to cheer you up during your worst moments. They spoke loudly of the horrors of bone marrow biopsies and the pain that is inflicted. The patient's voice held a world weary tone that insinuated, been there, done that. I'll only put a tip-toe onto the soap box for this one. If you're in a room full of people waiting to have similar procedures, the polite thing to do is not broadcast your negative opinion of what is about to happen to everyone. There may have been a few first-timers there who were already nervous and your graphic detail of the exquisite pain they were about to suffer probably didn't help reassure them of the necessity of the procedure. The worst part of it is the lidocaine injection. That's it. If you can survive getting numbing shots at the dentist, you will definitely breeze through this. If you're still worried about it, ask for conscious sedation. Your doctor will prescribe you ativan, or give you veracet for anxiety. We all have different thresholds for pain and the unknown. My threshold happens to be high. I have had so many bone marrow biopsies and aspirations that one of the technicians assisting with this one breathlessly asked how many I'd been through upon seeing the dimpled scars on both of my hips. I laughed and told him to count the pockmarks like tree rings. I know that I've had twenty-plus procedures. As for exact numbers, I couldn't tell you with any certainty. I have only had one bad procedure which was performed by a very petite woman who did not have the strength necessary to bore out a decent bone fragment. She eventually got it and I will never forget that day. There is a strange sucking sensation when the marrow is drawn out. I couldn't do an adequate job of describing it because there are no words descriptive enough. The best I can do is to tell you it's like being touched in a place that never sees the light of day. If the person performing the procedure is on their game, you'll be in and out in less than twenty minutes. My PA was fabulous and was done in fifteen. We chatted the entire time about the lack of minority donors on the bone marrow registry. She is of Vietnamese descent and will be hosting a bone marrow drive late in April. The world would be a better place filled with the kind of understanding she exuded. Bottom line, when it comes to bone marrow biopsies, you're the boss. If you want sedation, ask for it to be arranged ahead of time. If you're only comfortable with a certain set of individuals doing the procedure, request them by name. Terry is one of my particular favorites, but is in constant demand. She will have you entertained the entire time she's fishing for liquid gold. If something doesn't feel right, say something. There's no need to suffer in silence. I was more or less within normal ranges. My white blood cell count was high for me, but I have a valid explanation. That thing my digestive system does--you know, where it stops moving, was kicking off. My abdomen was swollen and I was on day two of now movement. My AlK/PHOS is still high, normal ranges are 38 IU/L-126 IU/L. Same goes for ALA/AMIN. Normal is 7 IU/L-56 IU/L. I'm so close. They checked my ferritin levels again. This is the amount of iron stored in your liver. I'm at 2939 NG/ML and normal is between 10 NG/ML-291 NG/ML. I'm not sweating it, because I know other patient's whose numbers are ten times worse than mine. Exjade was mentioned and discarded once again. Dr. K. wants to continue to wait and observe it. My thyroid was checked this go round and what a revelation. The thyroid stimulating hormone registered 6.25 MCU/ML. Normal is 0.50 MCU/ML-5.50 MCU/ML. I heard hypothyroidism for the first time. This may explain the extra few pounds that I can't shake regardless of how hard I work at it. More on this when I talk about the endocrinology visit. Dr. K. wants to wean me off of tacrolimus. I'm down to 0.5 mg every other day for a month and then nothing. I have to be on the look out for serious GvHD and I'll continue to have blood draws locally to monitor my liver involvement. If anything starts to look funny, I'm back on the horse. Since tacro is going, I don't have to take valtrex, bactrim, actigall, folic acid, magnesium, noxafil, and whatever else I'm forgetting, anymore. I may now do some light gardening and have the extremely occasional taste of alcohol. Chris and I will celebrate this weekend with a medium rare steak and a glass of red wine. Since I'd like to return to LSU this fall, there was a bit of paperwork that I needed to get Dr. K. to fill out. LSU requires all students to be able to prove that they've been vaccinated against the usual funk. It's that or you must provide an exemption from your doctor. I assumed that I'd get the exemption. I gave Dr. K. the paperwork and she ordered vaccines. I got seven shots to the arms. SEVEN. Three in my right and four in my left. By the end of the day, I couldn't operate my right arm from the elbow up. I am not kidding. If I wanted to move it away from my body, I had to push it with my left arm and even then, I didn't have a full range of motion. By the time we pulled into our driveway, I couldn't use either arm to pull myself out of the car. Chris had to come around and open the door and wait while I threw myself out. He even had to undress/redress me. It was all out pitiful. I got in to see the endocrinologist at 4:45pm. The appointment was for 3pm. He had a fabulous bedside manner and the kind of laugh that will stay with you. It was very like my friend Laren's laugh. You'd be able to locate either person in a crowded room by following that joyous outburst. Here's where things got fun. I have now learned that your actual diagnosis based on the numbers your body provides is really up to the doctor doing the diagnosis. Last go round, I was told that I was osteopenic. Dr. J. informed me that I fell within the normal parameters and that I will be inclined toward osteopenia and osteoporosis. He had test results beginning in 2007 to compare to and informed me that I was very well built where bone density and skeletons are concerned. Be still my beating heart. Apparently, I had enough bone density in reserve to help me through the chemo, etc. He concluded that I would not be placed on any maintenance drugs to slow down bone loss. He wants to have me checked again in a year. He also informed me that the calcium that I've been taking is probably the culprit behind my constant bouts with constipation and digestive pokiness. He wants me to switch to the chewable calcium supplements since they tend to be more friendly to your colon. He addressed my TSH level and explained that I'm extremely borderline. He didn't want to add any medications to my regimen since the number is just slightly elevated above normal. I'll have it checked again in three months when I'm next at MDA. The last thing Dr. J. addressed was my lack of estrogen. I've been post-menopausal since June 2008. My skin and body can attest to the lack of hormones. I am literally shaped like my 92 year old grandmother. The turkey wattle that all of the women on my mom's side of the family develop post-menopause is slowly taking shape under my chin. I am not imagining it, a few PA's have confirmed its existence. Dr. J. explained the need for hormone therapy to me and went through all of the pros and cons. It all boiled down to the fact that I was 35 and my body expected a certain level of hormones. He went through the studies and the incidence of breast cancer, etc. He explained to me that I could stop it whenever I wanted to based on how I felt. I was so thrilled with the prospect of feeling normal again, I nearly gave him a high-five. He started me on prempro. The dosage will be adjusted based on how it makes me feel. I took the first pill yesterday. He also prescribed 50,000 IU of vitamin D to be taken once a month. This is because I can't really benefit from direct sunlight thanks to the whole GvHD thing. For those who don't know, your body makes vitamin D with the help of sunlight. It's one tiny pill that's easy to swallow. He also encouraged me to increase my consumption of foods rich in calcium. I'm lactose intolerant, so I'll do the best I can. We left MDA around 5:45pm and hit up Vietopia for some excellent Vietnamese comfort food. Have I mentioned that I love this place? We were on the road around 7pm and made it home by 12:15 pm. You wouldn't believe it, but 10 minutes from our house, we hit a massive road block on the interstate. We would have been there for hours, save for the fact that Chris elected to follow the lead of a few cars that went off road to get to a feeder street that would take us home. Had we not seen a Camry manage it, I don't thin we would have tried. To cap all of this off, my dear friend, Tina, was staying with us. She flew in from NYC for jazzfest and would only be with us one night. She got in while we were in Houston and was asleep by the time we got home. The next day, I awoke with a low grade fever and was vomiting. So much for being able to spend time with a friend. My sorry state was thanks to a few of the vaccines that I'd been given. Chris had to take the day off of work to look after me. I got to actually visit with Tina for maybe an hour in between heavy napping. Chris took her out for lunch and sent her on her way around 2pm. I slept on and off until the late evening. Chris would wake me to make me drink and take my temperature. As of this morning, I still have a low grade fever. The literature regarding the vaccines stated that this could go on for three days. I've alerted the team at MDA and they don't seem concerned. I think I've covered everything, but in my present state, I wouldn't be surprised to have missed something. I know I promised an MDA update tonight, but I woke up with a slight fever from the vaccines & have been vomiting, also a reaction to one of the vaccines. Dr. K. warned me it might happen. I have been asleep for most of the day to boot. I'll update late in the morning on Friday. Just so you don't worry, all went well and there's nothing to worry about. I hope they won't mind, but I copied TeamMatthew's blog post, hoping to give Matthew and Chloe a boost in votes. I found Matthew's blog through my friend Nancy. Chloe and Matthew are entered to win a free wedding care of Crate and Barrel and they need your votes! Please take a moment and vote for these two. Voting closes in 13 days. 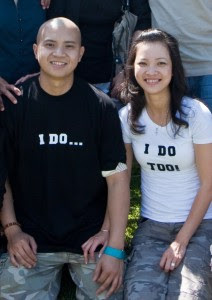 TeamMatthew Blogs: Since we had to post-pone our May 23, 2009 wedding, we decided to have a family get together anyways that day, hence our “I Do…” and “I Do Too!” T-shirts. 5. click on the link in your email and hit VOTE again! Easy peazy! Takes only a minute, we promise!! Don’t forget to confirm your email address or your vote won’t count! The contest started on 2/1 so we’re a little behind, so please please please vote, and vote sooooon!! Please please please PASS THIS message to your family, friends, friends of friends, co-workers, anyone — we need all the help we can get! Thank you, thank you, thank you!! We’re sooooo excited to finally get married, but we’d be uber excited to do it for FREEE!! I hope she won't mind, but I wanted to congratulate my donor on her new baby. I'm so excited for you guys! Before we moved into the house last year, I had determined that these three trees planted in the center of the front yard would be removed. I had several reasons, the first of which being that they're placed relatively close to the house. I was thinking of their root system and how those insidious little roots would be creeping ever closer to my house's foundation. Concrete is not an impediment to the natural order of things. We've all seen plants coming up through cement. The trees were covered in dull, brittle, dark green leaves that carpeted the lawn and blew out into the street. They blocked the view of the magnolia tree planted on the cul-de-sac. If you asked, I could give you a hundred reasons that the trees needed to go. Now that I've lived with them for almost a year, I think I know the reason that some long ago homeowner planted them thus. They're visible from four rooms in the house which is covered in windows. There is a certain element of privacy and solitude when the leaves hang thick and lush on gently swaying branches. I can leave the blinds open on the picture window in the kitchen and unless you come into the yard, you wouldn't be able to see me. The cats love watching the multitude of birds darting from the tree to the ground and back. Etsuko and Akiko can often be found sitting on opposite ends of the window ledge chattering quietly in their staccato little meows, beckoning the birds closer. A few days ago, tiny buds began appearing on the once winter bare trees. 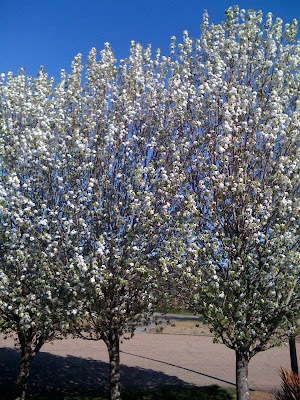 Three days ago, tiny white blossoms burst out amongst the three trees. They're lovely to look at and are a nice harbinger of the spring to come. The weather has been mild and sunny these last few days, in very stark contrast to the horrible weather my friends in the northeast have been experiencing. I would desperately love to be outside, sitting in the shade of those lovely trees, enjoying the light breeze and moderate temperatures. Unfortunately, I'm confounded by a problem that I don't expand on very often. I have a mild case of skin GvHD which is triggered by sunlight. It doesn't have to be direct sunlight and I can wear sunscreen and long-sleeved shirts and hats with brims while sitting in a covered area and still suffer the consequences. When I volunteered in New Orleans at the bone marrow drive a few weeks ago, I stood in the shadow of a tent. A few days after the event, my face erupted in tiny blisters. My chest was covered in a prickly rash and nearly every inch of me itched. As one cluster of blisters began the inevitable process of scaling over, another cluster would pop up somewhere new. The skin of my nose was constantly inflamed and irritated. At one point, it looked like I was peeling from a sunburn. I know my friend, Nancy, can relate since she's been dealing with it for far longer than I have. I apply lotions and creams and unguents and they seemed to work for a few weeks. Then the skin around my eyes began peeling. More specifically, my upper and lower lids. I finally gave in and ordered the pharmaceutical moisturizers the dermatology fellow at MDA recommended to me after the first transplant. They're helping. I still break out into rashes, but they don't flake as badly once they dry out. The lip treatment is the first to make my lips feel supple once again. I've learned that about five minutes in the sun is what I can tolerate without incurring too much of a reaction the next day. That's about the time it takes me to walk across a parking lot or load groceries into the car. I'd like to start LSU in the fall and for those of you who have never seen the campus, it's very open and very large. Student parking is around the perimeter and it's quite a little hike to get where you're going. I'm considering lobbying for a parking pass that would allow me to park in disabled spots. The very thought of this makes me feel like a fraud. I can walk under my own power without assistance and those spots really belong to people who need to be closer to the building. I'm going to try to think of an alternative. Most of my classes should be in a tight cluster of buildings closer to student parking, so I may be able to manage. It will all get sorted once the time arrives. Last week, I started that independent study course I've been talking about. The first assignment has been graded and I think I'm going to be fine. It took me four days to answer five short essay questions because I'm still having trouble with reading comprehension and retention. The true test of my ability will come when I take the first of three tests attached to the course. I have a few more assignments to get through before this happens, so we'll see. Speaking of which, I need to get started on lesson number two if I have any hope of completing the entire course by May. Honestly, though, I'd much rather sit in my kitchen and admire the view. Chris and I have often written about milestones and anniversaries throughout treatment and recovery. Dates usually weigh very heavily upon my mind, so much so that they occasionally find a way to penetrate my dreams and upset my balance. For instance, today would have been my dad's 75 birthday had he survived cancer. He did not and I got that heinous call April 6, 2001. That's another date that will be creeping up on my psyche. September 7, 2009 was the one year anniversary of my second transplant. I carried a lot of anxiety in the days leading up to that special milestone. October 7 marked my thirteen month anniversary post transplant. There were strange dreams leading up to that day as the little box full of nightmares I keep tucked away in my mind popped open to let a few fears drift out. I was cancer free thirteen months after the first transplant. The next big milestone I was working toward was the magic eighteen month marker. If you can make it cancer free to this arbitrary day, your chances of survival eek up ever so incrementally. I set goals ahead of this day, promising myself that I would take charge of my physical health in one of the only ways I could truly control. I hit the treadmill and started strength training. It's getting easier to put the milk back on the top shelf. I don't know if anything has truly changed, but the days leading up to lucky eighteen were quiet. My mind was still and the monster in the box didn't so much as exhale. Perhaps it was the fact that we had house guests that kept me preoccupied. Maybe it had something to do with the focus I've placed on planning and executing the special menus required of Chris's diet. I can vouch for the fact that I was more worried about a textbook I'd ordered arriving in a timely manner than I was about relapsing. March 7 was here and gone before I realized its significance. I sailed past the big eighteen month marker without even realizing it. I wouldn't have celebrated it, but I am rather surprised that I wasn't experiencing any undue panic as I have in days past. 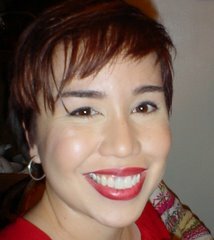 Saturday, I saw my friend, Lydia, who owns the Garrett Neal Studio in Baton Rouge to have my hair cut and colored. Chris came along to get a trim and visit with Lydia and her son Garrett, who's also a stylist. Sunday, I started doing our taxes. This past weekend was so absolutely normal, it was outstanding. Perhaps the secret to keeping my fears in check is a busy life filled with the activities that used to be routine to me pre-cancer. I didn't realize that I'd forgotten to be afraid until Tuesday, which made me smile. Lydia gave me a funky, edgy styling. The fabulous and incomparable Lydia. I'm going to shamelessly plug her salon here: if you're in Baton Rouge, or nearby, you should do yourself a favor and book an appointment. Lydia and the gang at Garrett Neal Studio will keep you entertained while pampering you. You'll leave smiling and looking fabulous. Ann says I have to blog today since she is out of ideas, so here goes. Its been two weeks since I went 'under the knife' so to speak, and things are shaping up pretty well. The first couple of days were pretty rough...recovering from the anesthesia was particularly dicey. However, after lots of bed rest I eventually regained the ability to stand without hurling like a teenager after drinking Vodka for the first time. It was a bit strange being on the receiving end of care and attention though. After three years it took a little bit of getting used too, and Ann admitted it was pretty strange for her too. I'm sure she will reflect on it here soon. Lucky for me, the love of my life took such great care of me and I'm pretty much back to 100%. Two days ago I started eating solid food again and I have to say the lap-band works. There is a marked difference between the amount of food I could eat and feel 'full' before the surgery and after. If you step a little out of line and go for that extra bite, it really gets your attention quick. The experience is very Pavlovian...in a good way. So after two weeks how much progress have I made? Starting weight 304 Lbs (9.44 Slg * 32.2 Ft/s^2), current weight 294 Lbs. Difference of 3.2%. Not too bad so far.